RAVENOL Kompressorenöl VDL 100 meets the high requirements of DIN 51506. Specially designed with high quality, age-resistant base oils. RAVENOL Kompressorenöl VDL 100 has a good adhesion, is water repellent and wear reducing. As many compressors operate at high temperatures, the oil should have good aging resistance at very low residue formation. RAVENOL Kompressorenöl VDL 100 provides a secure lubrication not only in the upper temperature range, also in the cold state of the compressor to achieve a reduction of wear. By selected and coordinated additive composition the tendency to coking and the formation of flammable residues is minimized. RAVENOL Kompressorenöl VDL 100 can be used in stationary and mobile compressors with discharge temperatures up to 220°C. 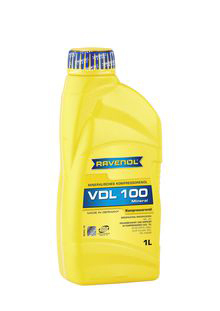 RAVENOL Kompressorenöl VDL 100 can also be used for lubrication of engines and diesel engines where the manufacturer does not stipulate any HD motor oil. RAVENOL Kompressorenöl VDL 100 meets the requirements of VDL-oils. The requirements for VBL-and VCL-oils are exceeded by far. Meets the requirements: ATLAS COPCO, ABAC, ALUP, CompAir, FIAC, FINI, KAESER. Very good cold starting properties.